The Valspar Corporation continues to enhance creative choices and simplify architectural coating specifications by adding color-accurate, building information modeling (BIM) tools to Autodesk Revit® software for its Fluropon® 70 percent PVDF resin-based coatings. With its high durability and large color palette, Valspar’s Fluropon exterior coatings are the industry standard for both metal coil coating and aluminum extrusion applications since their launch in 1965. “For over 200 years, Valspar has helped people connect to the power of color. For the last 50 years, architects and design professionals have relied on our Fluropon products to protect their commercial buildings’ exteriors. We are excited to offer our proven products with Revit’s software for the ultimate convenience in previewing color selections on their buildings’ designs,” said Jeff Alexander, vice president of sales for Valspar’s global coil and extrusion businesses. 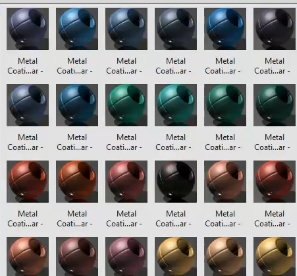 Once Valspar’s Fluropon material library has been loaded into a Revit model, the Fluropon colors are ready to select by using the “Paint” tool on a variety of architectural building products exterior metal surfaces. 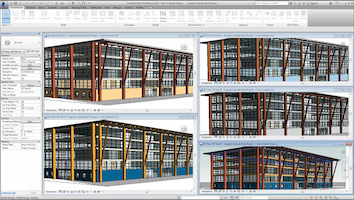 Valspar’s Fluropon material library in Revit is built around accurate Valspar color palettes to ensure consistency in both the virtual and real world. 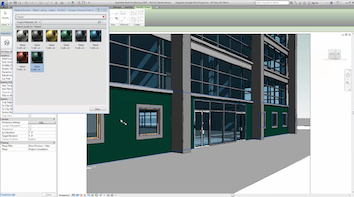 After selecting final colors, Revit users have the option to order physical color samples by visiting Valspar’s architectural website, http://www.valsparinspireme.com, and referencing the product code listed next to the color name within the material library. Meeting the American Architectural Manufacturers Association’s AAMA 2605 high-performance exterior specification, Fluropon demonstrates reliable performance including resistance to harmful ultraviolet rays, chemical degradation, abrasion and humidity. These field-proven, high-performance, 70% PVDF resin-based coatings are offered in two- to four-coat systems in nearly any formulation, including low gloss, low sheen and solar reflective ENERGY STAR. A wide variety of colors also are available, from neutral to bright colors, micas, metallic and pearlescent coatings. Along with its new BIM tools and its proven, high-performance coating systems, The Valspar Corporation supports architects and designers with its industry-leading technical expertise, color-matching and sustainability resources, responsive customer service and high-priority lead times. Learn more at http://www.valsparinspireme.com/bim.html.